Goal achieved! May 20th represents 37 weeks pregnant, which also means that I am now full-term! It also represents my long-time pregnancy goal. I'm absolutely thrilled and feel very fortunate and blessed to have kept the babies in there for this long. As most pregnant women (especially with multiples) can attest to, come the third trimester, preterm labour becomes a constant worry. Sure, the babies could have survived if they had been born at 26, 30 or 34 weeks, but the potential short and long-term complications would have great. 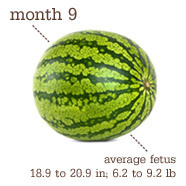 37 weeks also represents the FINAL fruit comparison....the giant WATERMELON (x2)! Baby's now the size of a watermelon! Your full-term (yay!) baby is gaining about 1/2 ounce a day and getting his first sticky poop (called meconium) ready. He's also brushing up on skills for the outside world: blinking, sucking, inhaling, exhaling, and gripping (it's getting strong!). "I wish I had two moms..."
Mom, Mommy, Momma, Maman, Ema? ?